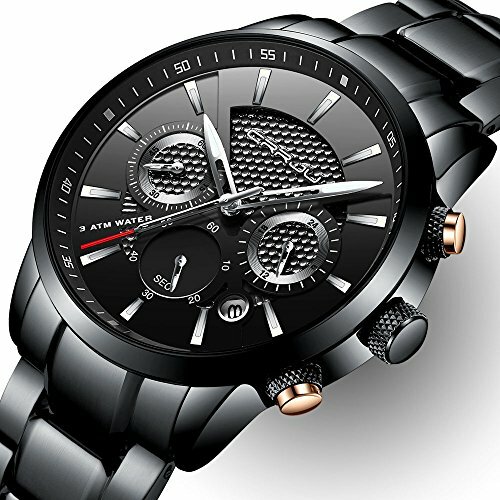 CRRJU New Design Men Classic Business Watch. Leading Edge Fashion, and Value. Very beautiful sport wristwatch with 316L stainless steel band. Also make it a great gift watch for family or friends. 1.PRODUCT DETAIL and QUALITY : Exquisite 3-sub Dial Analog Display ,1/2 sceond and minute Chronograph ,24hours show.Japan Seiko movement and Sony battery , Provide accurate time keeping and a long service life. all these let this watch elegant and comfortable to wear. 2.UNIQUE and ELEGANT DESIGN: 316L Stainless steel watches Band. Equipped with a watch tool for easy removal of the strap, Of couse, you need right use the tool. :) Accurate Classic Calendar, High Hardness Mineral Glass Watch Face,Hard and Clear; Men's Standard design ,This is a perfect travel and casual watch for you. 3.WATERPROOF FOR DAILY USE: (30 M), Wash hand, Swimming, No problem! Perfect for business, casual, indoor activities or daily use. NOTE: Please DO NOT press any buttons in the water or wear this watch for longtime underwater activities - such as diving, ect. If you have any questions about this product by CRRJU, contact us by completing and submitting the form below. If you are looking for a specif part number, please include it with your message.